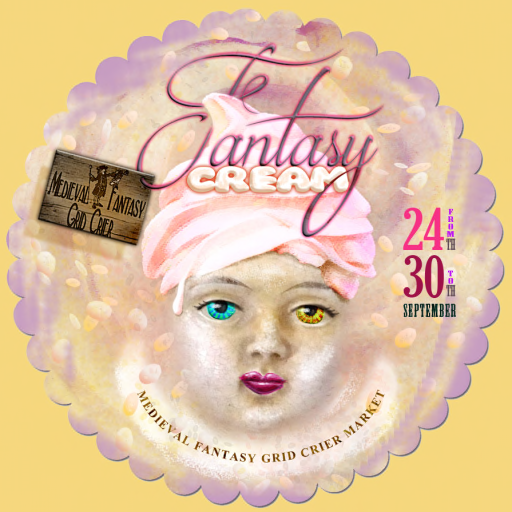 FANTASY CREAM III from 18th March to 18th April 2016. One of my favorite events here in Second Life is the seasonal Fantasy Cream. This event features some of the most amazing designers all part of the Medieval Fantasy Grid Crier. Runa and Luna always put their heart and soul into the creation of the MUST SEE grounds. So be sure to take a walk in the garden, enjoy the HUNT, VOTE & WIN some wonderful gifts. BMe Rebecka makes everyday a walk in the garden in this original mesh dress by SolasNaGealai. The soft hues of spring are weaved with love to create these romantic pieces. Tonal ribbon trims the damask underdress. Matching embroidery design with spring flowers and hummingbirds brings the plaid overdress to life. To finish the look the dress is adorned with a fresh mix of flowers. March BMe NEWS , Hunts, events and. . . GIFTS! NOW – 31st BMe is taking part in the popular WomenStuff HUNT. 150 talented designers take place in this amazing grid wide fashion hunt. To take part at the start of the hunt, please find stores and LM here. BMe hunt gift is a fun playful dress, perfect for a spring day. “Lana” is a soft sea-foam dress is adorned with a vintage glamour print of peach, creams and gray tones. March 1 – 27th is another wonderful Fair Play event, the new Emerald City build is breathtaking and a must see!!! Also new is the wonderful “Jewel Gocha”, each designer has made a prize that is given at random as you find the jewels throughout the event grounds. Sales of each creators exclusive item are split 10% – 50% to following foundations: Team Fox for Parkinson’s Research & Relay for Life of Second Life. This month BMe is offering a timeless style that will adapt for any genre. “Darcy” is a fitted mesh outfit original design by SolasNaGealai, Comes in Slink, Classic avatar fits and will work on MOST avatars in SL It’s only 225L during Fair Play. For the Jewel Gocha prize I have a coordinating rose crown that can be worn with or without the dress. As always you can find TWO Group Gifts from BlueMoon enterprise, just perfect for those that need a spot of green to see them through March. At the BlueMoon enterprise main store I have set out “Lady Juliet” a romantic inspired gown from a bygone era. At the Creations for Parkinson’s store I have set out a more up to date fashion item, the gorgeous “Lady Lisa.” Remember 100% of lindens sold at the Creations store goes to Team Fox, part of the Michael J Fox foundation for Parkinson’s research. That takes care of the 1st week of March but rest assured there is lots more NEWS, EVENTS and NEW DESIGNS to come over the next few weeks.